Dry eyes are a common discomfort - reading, stress, contact lens wear, and staring at the screen all day can dry out your eyes. We all want our eyes to feel better, but many dry eye sufferers are concerned about the chemicals and preservatives found in eye drops. 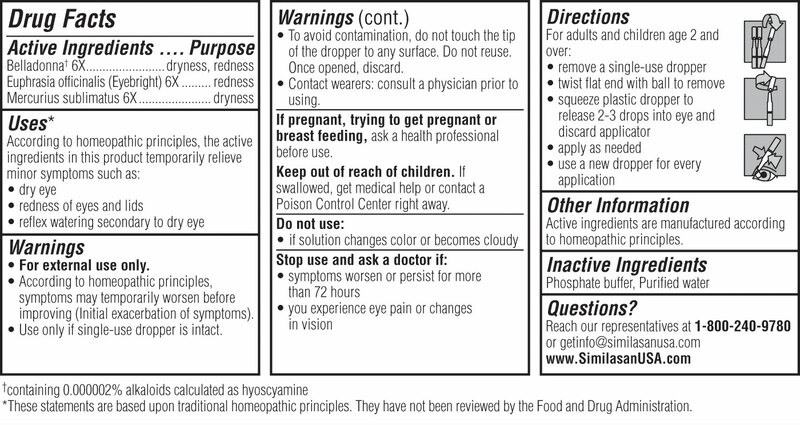 Traditional over-the-counter drops use chemicals to mask symptoms. Similasan of Switzerland works differently, by using natural botanical extracts used for over 200 years to stimulate the body's natural defenses and target the root cause. Similasan products are made without harsh chemicals, so you can use them as often as needed. Q: How do I use the single-use droppers? A: Break off one single-use dropper. Twist the flat end with ball to open dropper. Squeeze plastic dropper to release 2-3 drops into each eye. Discard dropper after use. Use a new dropper for every application.